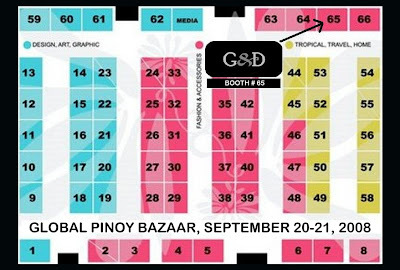 Please visit Girl & Dress at the Global Pinoy Bazaar, Rockwell Tent, this September 20 & 21 (Saturday and Sunday). Check out the fab & flattering pieces from G&D's Holiday collection, and avail of special discounts on selected items! Featuring tops, tunics, dresses, vests, and coverups in jersey, knits, and chiffon... all in a variety of subdued hues, graphic prints, and delicious jewel tones. Stock up on your favorites for your upcoming holiday soirees and get-togethers! G&D is also available at The Ramp at Glorietta 3. G&D will be sharing a booth with MANNA by Rachel Nubla, a line of the cutest tees for infants and toddlers that are super affordably priced. A great Christmas gift idea for all your nieces, nephews, and godchildren! The Global Pinoy Bazaar is organized by YABANG PINOY, which actively campaigns for Filipinos believing in and supporting fellow Filipinos, and consuming Filipino-made or Filipino-designed products. So, for those in Manila, mark your calendars and visit the Global Pinoy Bazaar this weekend! im so excited! see you there!